Different people have different philosophies of life. Some people focus on compassion. Some people focus only on cash. The things that people focus on often drives their actions. People who are driven by compassion often talk about helping people. Starting from the heart, they aim to encourage and enable others to live fulfilling lives. They believe that compassion goes beyond sympathy and empathy. Compassion is caring in action. People who are driven by cash often talk about money. They sometimes say that making big profits is necessary to care for people. Cash is needed, of course, but caring for others sometimes comes way down their list of priorities. Different people show compassion in different ways. Some show it for their loved ones, friends and kindred spirits. Some show it for those they identify with, such as certain communities. Some show it for all human beings and future generations. Some show compassion for all living things and the planet. 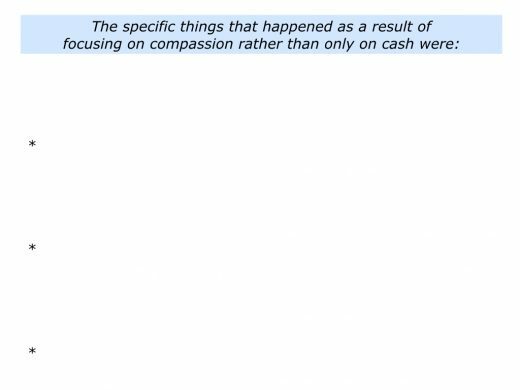 Looking back on your life, can you think of a situation when you chose to focus on compassion rather than only on cash? You may have chosen to show generosity, encourage a person or do something practical to care for people or the planet. 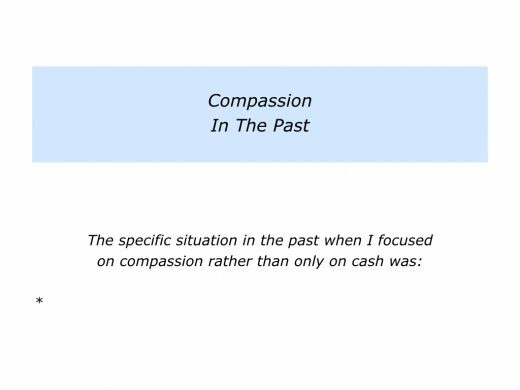 Describe a specific situation in the past when you chose to focus on compassion rather than only on cash. Describe the specific things you did then to focus on compassion. Compassion can produce enormous benefits, both for ourselves and other people. Some people are wary of showing compassion because they feel that others may take advantage of their kindness. We may need to show compassion, however, if we are to survive as a species. Karen Armstrong explored these themes in her TED talk that led to creating The Charter for Compassion. She believes it is vital to start from the heart and create hope, rather than spread division. Karen and others have underlined the following points. Compassion is at the root of many religions and spiritual beliefs. So let’s revive the Golden Rule. Always treat all other people with the respect that you would like them to treat you with. Do not cause pain to others that you would not like inflected on yourself. Below is a video in which Karen describes this approach. The Charter for Compassion includes the following messages. You can discover more on its website. We believe a compassionate world is a peaceful world. We believe a compassionate world is possible when every man, woman and child treats others as they would wish to be treated – with dignity, equity and respect. We believe all human beings are born with the capacity for compassion, and it must be cultivated for human beings to survive and thrive. The Greater Good Center, based at the University of California, Berkeley, focuses on the science of living a meaningful life. 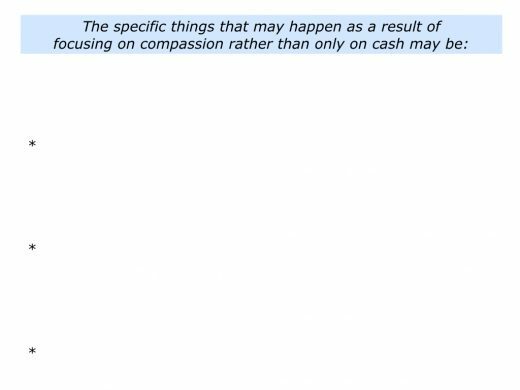 Here are excerpts from part of its website that is devoted to compassion. You can discover more via the following link. Compassion is not the same as empathy or altruism though the concepts are related. While empathy refers more generally to our ability to take the perspective of and feel the emotions of another person, compassion is when those feelings and thoughts include the desire to help. Scientific research into the measurable benefits of compassion is young. Preliminary findings suggest, however, that being compassionate can improve health, wellbeing, and relationships. Many scientists believe that compassion may even be vital to the survival of our species, and they’re finding that its advantages can be increased through targeted exercises and practice. Employees who receive more compassion the workplace see themselves, their co-workers, and their organization in a more positive light, report feeling more positive emotions like joy and contentment, and are more committed to their jobs. More compassionate societies – those that take care of their most vulnerable members, assist other nations in need, and have children who perform more acts of kindness – are the happier ones. Compassionate people are more socially adept, making them less vulnerable to loneliness. People can choose to be compassionate or cruel in their actions and words. The choice they make has consequences, both for themselves and other people. People who show compassion often have a history of being loved and being taught to respect other human beings. They believe in spreading happiness rather than hate. They want to plant seeds of hope that will encourage both present and future generations. Jeremy Rifkin outlines a similar approach in his book The Empathic Civilisation. He believes it is vital to recognise that our actions have consequences on the whole system. This calls for extending our empathy to the entire human family and the biosphere. Taking this step will increase our chances of surviving as a species. Here is a video in which Jeremy explains this approach. You can discover more via the following link. People who are compassionate often take the together view of life rather than the tribal view of life. They see differences as an asset that, channelled properly, can be used to help others. They believe in focusing on what people have in common – rather than continually looking for conflict – to achieve concrete results. They believe that people can combine their strengths to tackle the challenges we face across the world. They believe that people can work well together to create sustainable systems that create ongoing success for people and the planet. Let’s return to your own life and work. 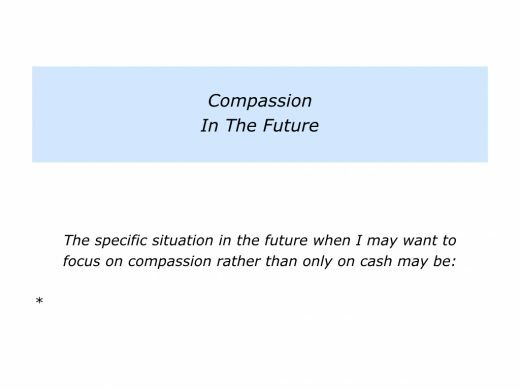 Looking to the future, can you think of a situation in which you may want to focus on compassion rather than focus only on cash? How can you demonstrate caring in action? If appropriate, how can you encourage and enable people to live fulfilling lives? What may be the benefits of taking this approach? 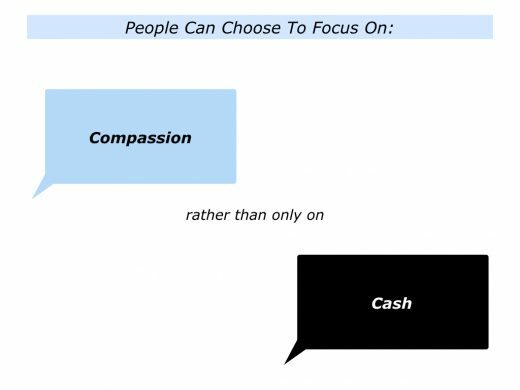 Describe a specific situation in the future when you may choose to focus on compassion rather than only on cash.